Luang Prabang, the UNESCO World Heritage-listed former royal capital of Laos, has a rich and vibrant Chinese heritage. For centuries, trade and traffic has flowed between the two countries along the mighty Mekong River or over the lush mountains that separate northern Laos and southern China, creating a deep historical connection and an inseparable cultural bond. This makes Luang Prabang an exceptional destination to celebrate Lunar New Year, and Pullman Luang Prabang has now unveiled a series of enticing promotions and culinary occasions to help welcome guests the “Year of the Pig” in style with their family and friends. Under the Chinese New Year Offer, guests can enjoy special rates starting from just US$158++ per night for two guests sharing a Deluxe Room, including daily breakfast. Each spacious 42 square metre Deluxe Room features a private balcony, allowing guests to soak up breath-taking views of the verdant Lao countryside. The resort’s contemporary international restaurant, L’Atelier, will present three consecutive nights of Chinese cuisine over Lunar New Year with a series of bountiful buffet dinners. Many of the dishes will be created using ingredients from the resort’s own organic garden or sourced from local communities. On Lunar New Year’s Eve, Monday 4th February 2019, the Chinese New Year’s Eve Dinner Buffet will showcase a wide range of authentic delicacies and delectable desserts, accompanied by a live band. Hosted from 7pm to 11pm, this festive feast is priced at just US$35 net per adult, including free-flow fresh fruit juices and local beer, or US$18 per child (6-12 years of age). Kids aged under six dine for free. Then on Lunar New Year’s Day, Tuesday 5th February 2019, guests can gather their family and friends for the Year of the Pig Prosperity Dinner Buffet. This culinary celebration will be served from 7pm to 11pm and features an extensive selection of traditional Chinese dishes, plus free-flow fresh fruit juices and local beer – just US$35 net per adult, US$18 per child (6-12 years of age) for free for kids under six years. Finally, on Wednesday 6th February 2019, guests can come together at L’Atelier and celebrate the arrival of the Year of the Pig with the Good Fortune Dinner Buffet. This auspicious occasion will take place from 7pm to 11pm and is also priced at just US$35 net per adult including free-flow fresh fruit juices and local beer, US$18 per child (6-12 years), and free-of-charge for kids aged under six. A soothing start to the new Lunar New Year can also be enjoyed at the Pullman Spa. The Good Fortune Spa Package is a blissful two-hour body treatment that combines a deep tissue massage, a neck and shoulder massage and a foot massage. This exquisite therapy is available for just US$70 net per person, and a 30 percent discount is offered on all other individual spa treatments. 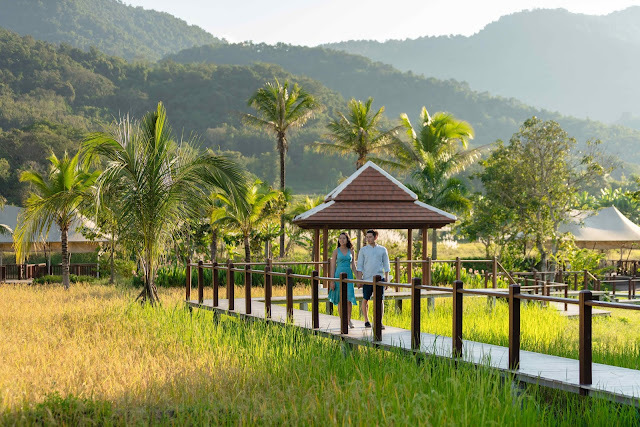 Nestled in the beautiful Lao countryside just outside Luang Prabang, surrounded by lush paddy fields, rivers and mountains, Pullman Luang Prabang is an idyllic five-star resort that allows guests re-connected with nature, culture and each other. For more information and to book your Lunar New Year retreat at Pullman Luang Prabang, please visit www.pullman-luangprabang.com, email [email protected] or contact +856 71 211 112.